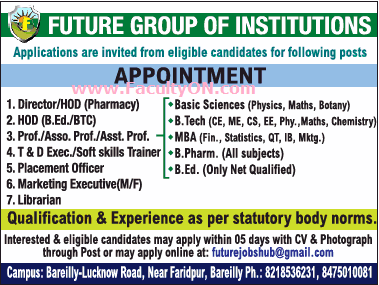 Future Group of Institutions, Bareilly has advertised in THE TIMES OF INDIA newspaper for the recruitment of Teaching Faculty- Professor / Associate Professor / Assistant Professor / HOD / Director Plus Non-Faculty jobs vacancies. Interested and eligible job aspirants are requested to apply within 05 days from 18th July 2018. Check out further more details below. About College: Future Group of Institutions has transpired from the ancient Indian ethos and the time tested methods of the professional institutions in the west. At FGI it is our continuous endeavor to deliver world class professional education without compromising on Indian values. How to Apply: Interested and eligible candidates are requested to send hand written application along with copies of certificates and recent passport size photo to the email address or postal address given below. Reference: Advertisement from Future Group of Institutions, Bareilly on THE TIMES OF INDIA newspaper dated 18th July 2018 for the recruitment of vacancy position such as Professor / Associate Professor / Assistant Professor / HOD / Director Plus Non-faculty jobs. See the copy of advt below.